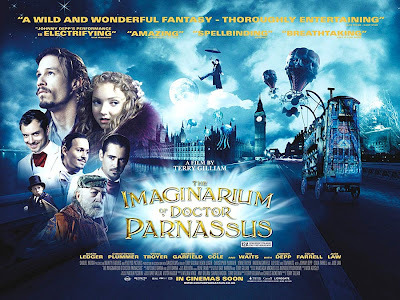 Terry Gilliam's latest film is out at the moment with the mouth twisting title of The Imaginarium of Doctor Parnassus. It stars Heath Ledger who died during filming. I chickened out at the ticket office and just asked for a ticket for Imaginarium - before ordering my bucket of popcorn. It turns out that the Imaginarium is a travelling show that leads people selected from the audience through a mirror into another world. Constructed from their wildest dreams and desires, this alternative reality is sustained by the mind of Dr Parnassus who used to sustain our world by the telling of stories. "Are you telling me that if you stop telling a story ... This story ... something you made up, a fiction ... that the universe ceases to exist?" And that's what a good book does. A book that sticks with you and changes you is one that creates a believable world and gives you space within it to interact and when it resonates with your experiences or what's bumping around inside your mind, then it has a power to truly connect with you in a profound way. "The people's need for stories grew. Stories that would feed a great hunger. A hunger for more than just understanding." We need stories, everything doesn't break down into information, data, the 9 to 5. We need writers who give space for the reader. We need writers who know their craft who can show us the wonder within their minds in a way we can connect with. We need writers who understand their fellow humans, who can weave a story for us to walk into. Cinema, music, TV - they are all great - but it is that most unlikely object sitting on the bookshelf, the book, that asks the most of you and provides such a wondrous return. That's why we need to encourage new writing, new voices. To nurture new talent. If we let market forces dictate what we read - then we will read the same thing over and over. Another Dan Brown anyone? Out there are writers who can show you things you never knew to ask for - things that will make you laugh, cry, make you remember you are unique, special. Or they will do given the chance to develop, to mature, to work within the publishing industry but not be conformed and shaped by it. Terry Gilliam is known for making astounding, different, non-commercial films that have people like Johnny Depp wanting to be involved. Sometimes he gets it a bit wrong - mostly he breaks new ground with films like Brazil. We need writers like that who don't write for the market, but dare to be true to themselves. Here's hoping that peoples' thirst for stories will grow and endure and the fixation on celebrity and the lowest common denominator will eventually shrivel up for the want of an Imaginarium. A life changing experience. A story well told. "That's why we need to encourage new writing, new voices. To nuture new talent. If we let market forces dictate what we read - then we will read the same thing over and over. Another Dan Brown anyone?" BRAVO! Mike. I agree. Encouraging new talent brings our more Terry Gilliams of the world. I was told recently by an editor at a major NY publishing house just last week that while she liked my story idea, she wanted a "novel of 100,000 words featuring a cop chasing a serial killer." I appreciated her honesty, and she knows what sells for her company. But, as you pointed out: "Another Dan Brown, anyone?" Fiction that sells to day seems cliche. 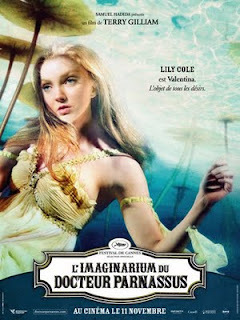 Thanks for the post, and I am definitely going to see "The Imaginarium of Doctor Parnassus." "she wanted a "novel of 100,000 words featuring a cop chasing a serial killer." It's like other areas of life - a good idea comes along - someone does something great - and then we spend years in creative freefall as everyone tries to copy it. Is that the ground getting closer? I can't wait to see this film, now I'm even more impatient!